How to Import to Lesotho? How to import to Lesotho? 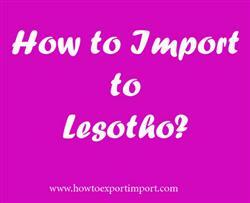 What are the import procedures in Lesotho to move goods? Explain about import registration process, cargo movement to Lesotho from overseas countries, Import delivery process in Lesotho etc. Detail the import methodology in Lesotho. This post explains about step by step procedures that need to be finished with Lesotho government authority for importation to Lesotho. Any Lesotho organization or individual has the privilege to deal with merchandise import and export. A registered trade with concerned license as per the business is must for exporting and importing of commercial products from and into Lesotho. The Lesotho Customs is administered by the Lesotho Revenue Authority (LRA) is basically responsible for the assessment, collection and remittance to the Government of public revenues in Lesotho, manages inflow and outflow of goods in Lesotho. This post explains about different phases in import process that every importer needs to go through in Lesotho. How to import to Maseru? Formalities for import to Maseru. Procedures to import to Maseru. Need to import to Maseru. Explain to import to Maseru. Information to import to Maseru. Step by step process to import to Maseru. Methods to import to Maseru. Guidelines to import to Maseru. Please guide to import to Maseru. Help to import to. Procedures required to import to Maseru. Requirements to import to Maseru. Difference between Clean On Board Bill of Lading and Shipped On Board Bill of Lading. How to obtain a duplicate BL, if original bill of lading lost? How to export from Trinidad and Tobago? How to export from India to Trinidad and Tobago? How to Import to Sudan? How to import to India from Sudan? How to find Chargeable Weight? What is DDP terms of delivery? What do you mean with DAP in a shipping agreement? What is DAT in a shipping agreement? How to export from Lesotho? How to Import to Norway? How to Import to Portugal? How to Import to Mali?